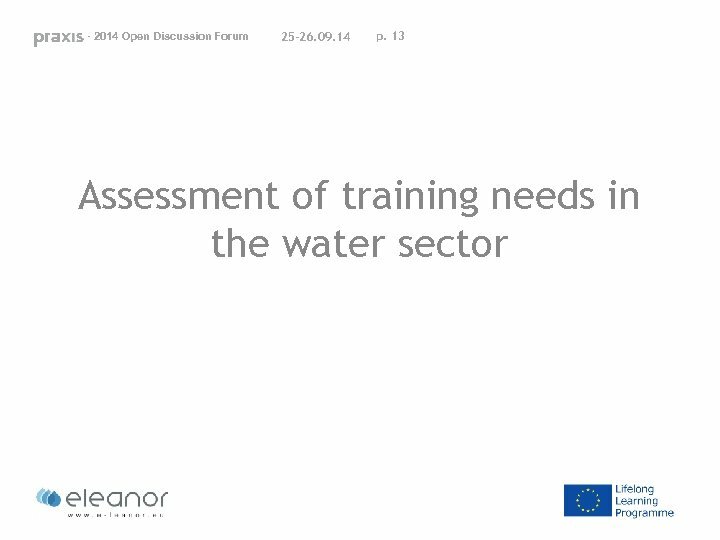 - 2014 Open Discussion Forum 25 -26. 09. 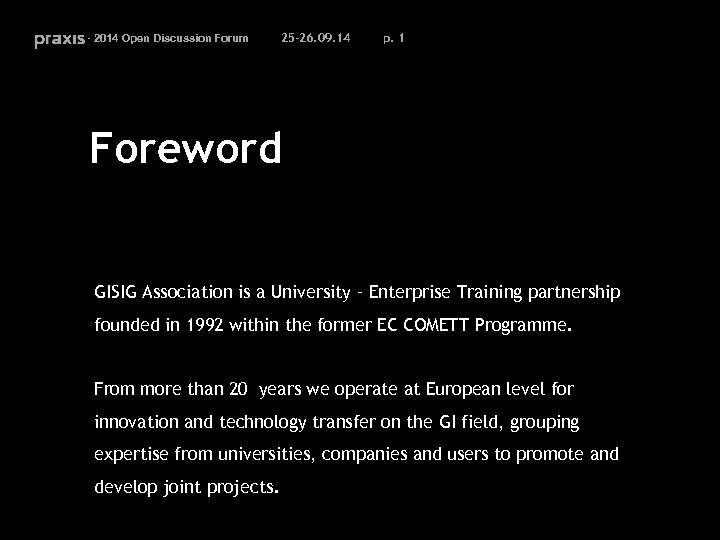 14 p. 1 Foreword GISIG Association is a University – Enterprise Training partnership founded in 1992 within the former EC COMETT Programme. 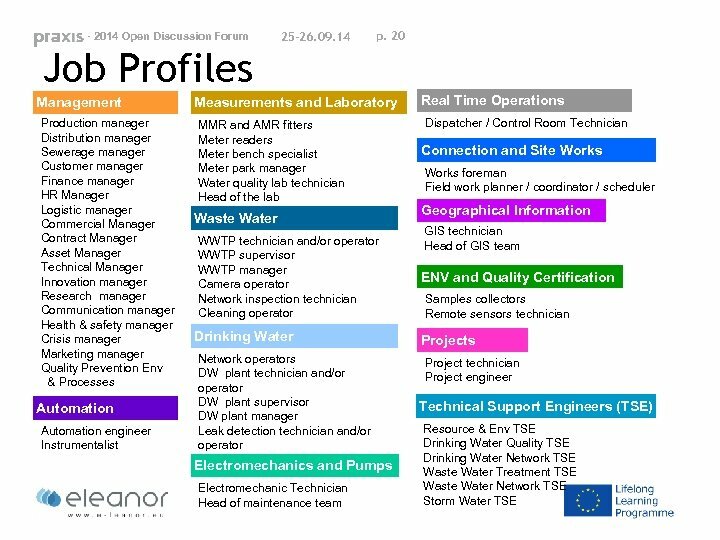 From more than 20 years we operate at European level for innovation and technology transfer on the GI field, grouping expertise from universities, companies and users to promote and develop joint projects. - 2014 Open Discussion Forum 25 -26. 09. 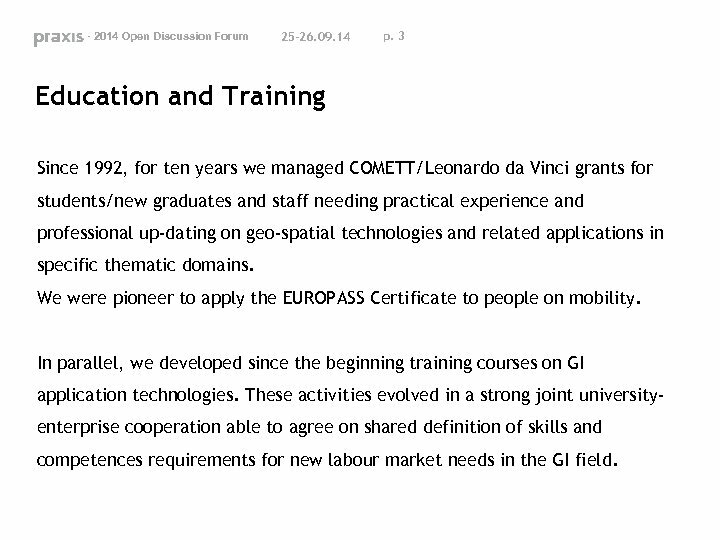 14 p. 3 Education and Training Since 1992, for ten years we managed COMETT/Leonardo da Vinci grants for students/new graduates and staff needing practical experience and professional up-dating on geo-spatial technologies and related applications in specific thematic domains. We were pioneer to apply the EUROPASS Certificate to people on mobility. In parallel, we developed since the beginning training courses on GI application technologies. 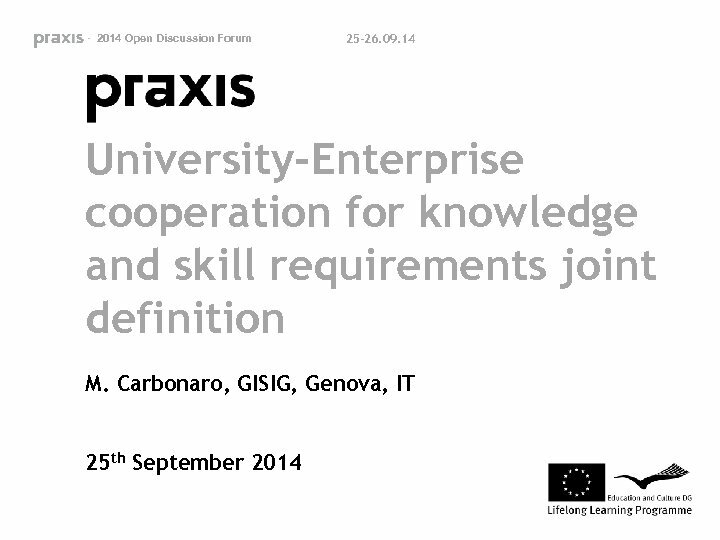 These activities evolved in a strong joint universityenterprise cooperation able to agree on shared definition of skills and competences requirements for new labour market needs in the GI field. - 2014 Open Discussion Forum 25 -26. 09. 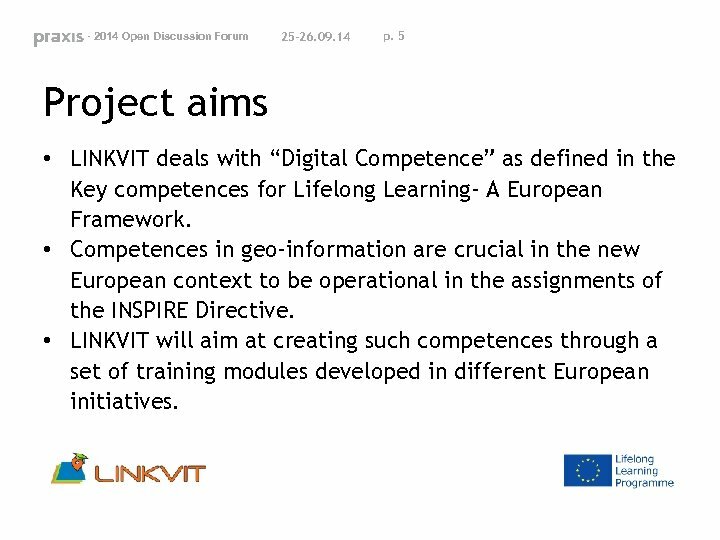 14 p. 5 Project aims • LINKVIT deals with “Digital Competence” as defined in the Key competences for Lifelong Learning- A European Framework. 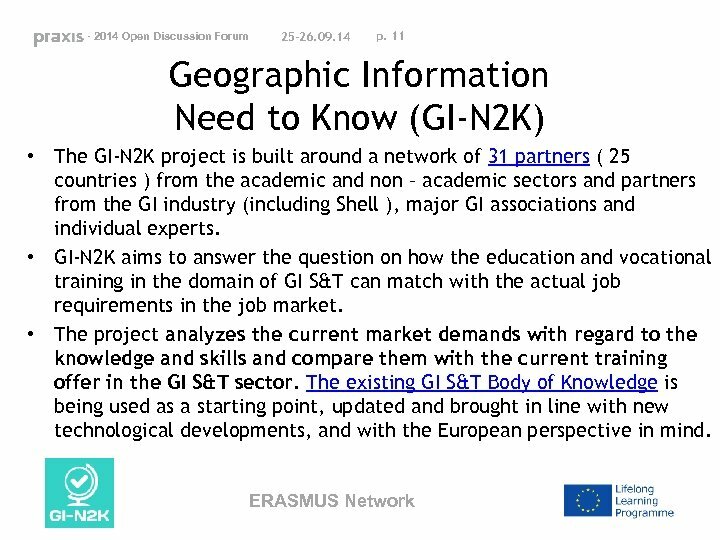 • Competences in geo-information are crucial in the new European context to be operational in the assignments of the INSPIRE Directive. 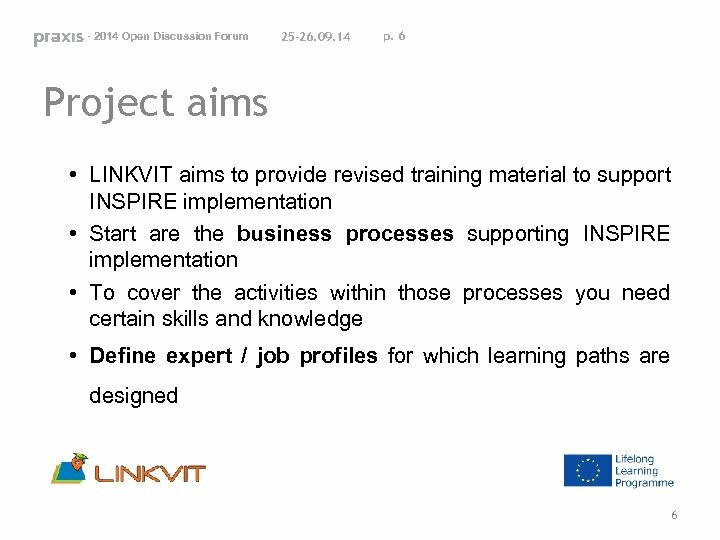 • LINKVIT will aim at creating such competences through a set of training modules developed in different European initiatives. 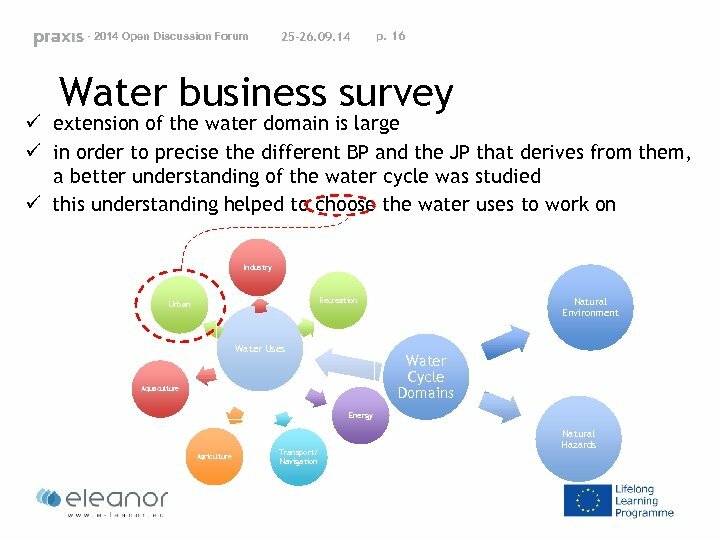 - 2014 Open Discussion Forum 25 -26. 09. 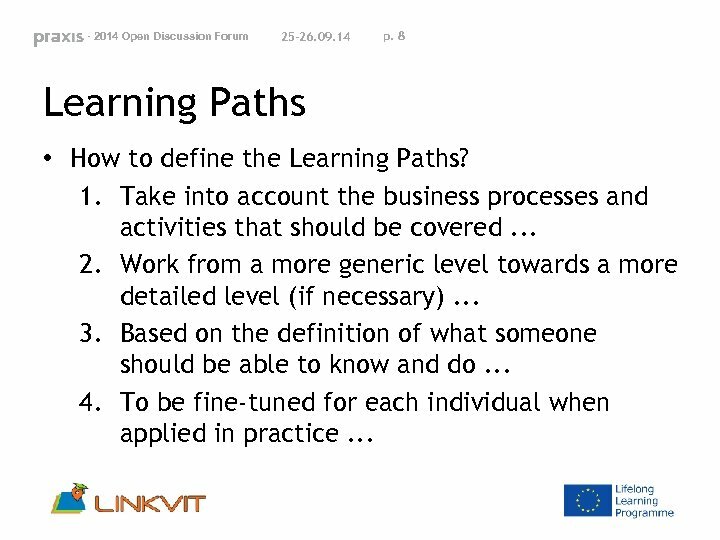 14 p. 8 Learning Paths • How to define the Learning Paths? 1. 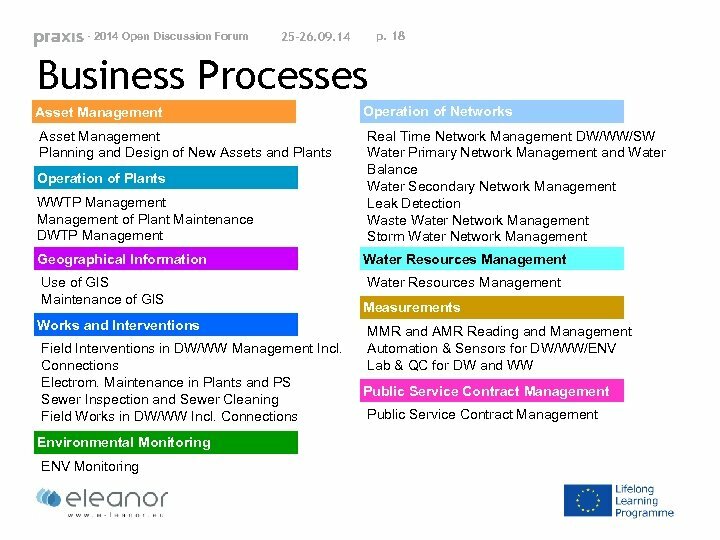 Take into account the business processes and activities that should be covered. . . 2. Work from a more generic level towards a more detailed level (if necessary). . . 3. Based on the definition of what someone should be able to know and do. . . 4. To be fine-tuned for each individual when applied in practice. . .
- 2014 Open Discussion Forum 25 -26. 09. 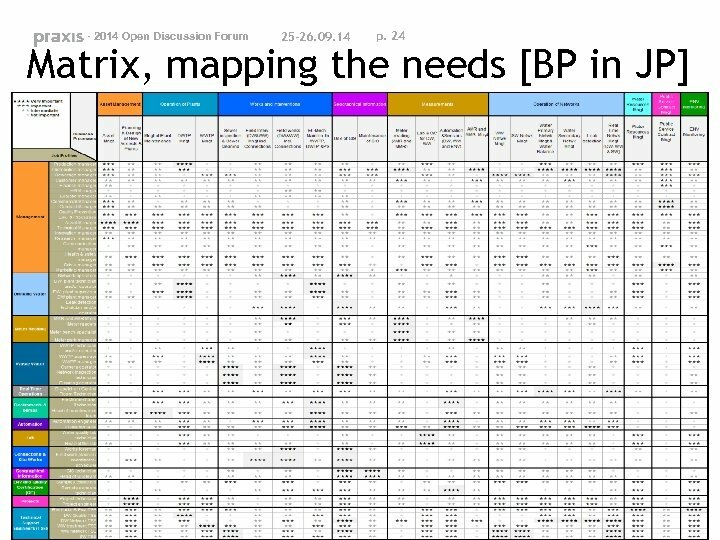 14 p. 10 Learning path • INSPIRE data expert – Assumption 1: no knowledge on data modelling. 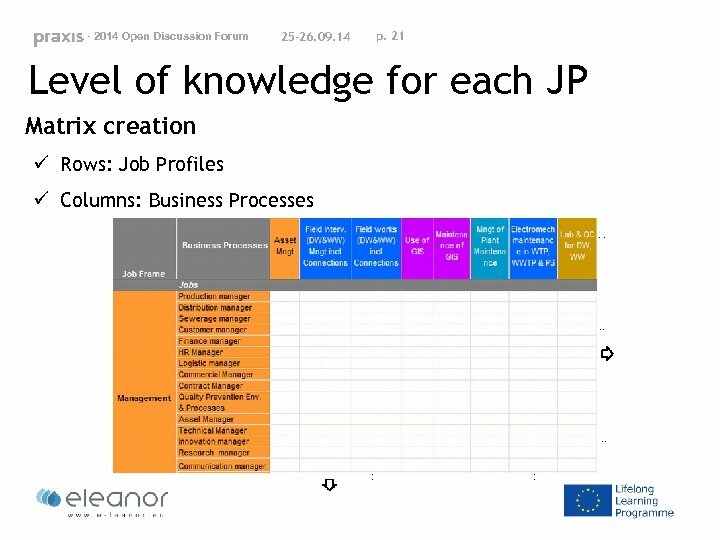 . . – Assumption 2: data management tasks in hands of one person. . . 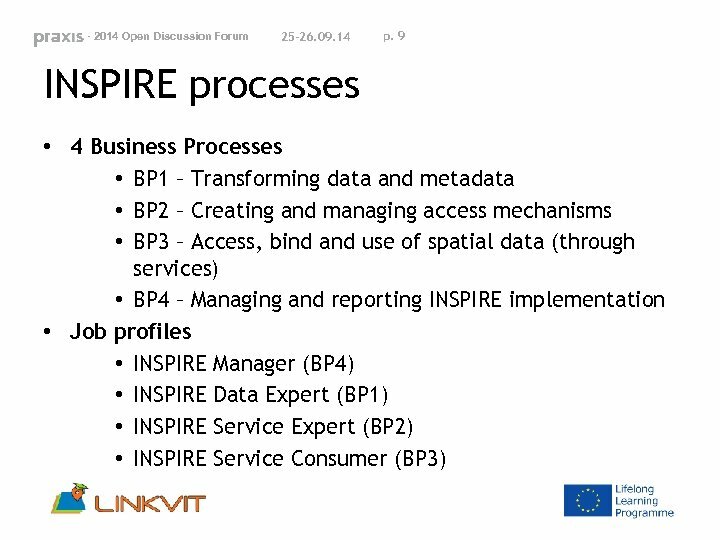 Intro INSPIRE 3 UML XML GML 16 16 Intro Data Specs Data Validation Data Harmonization 3 3 Examples Procedures . . . 3 3 . . .
- 2014 Open Discussion Forum 25 -26. 09. 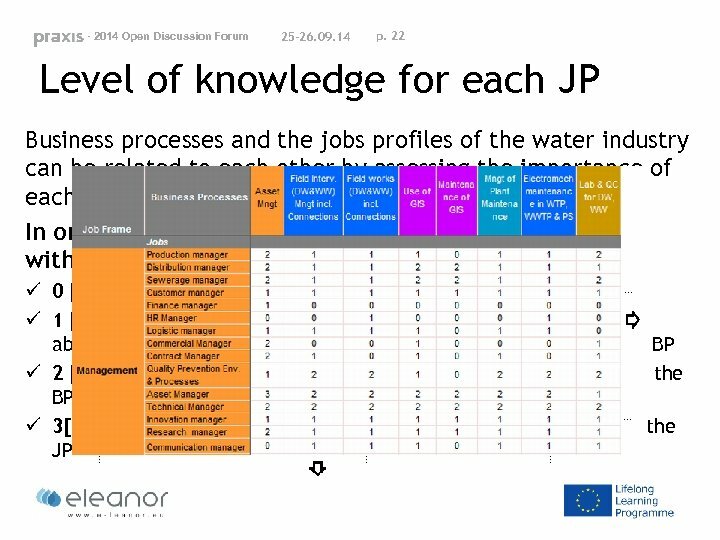 14 p. 15 Steps The vocational training needs assessment covered following steps: ü Water business survey ü creation of a lists of Business Processes (BPs) and Job Profiles (JPs), ü validation of the lists by water professionals, ü assessment of a level of knowledge for each Job Profile, ü validation of the levels by water professionals, ü creation of a matrix mapping the training needs in relation with JPs and BPs. - 2014 Open Discussion Forum 25 -26. 09. 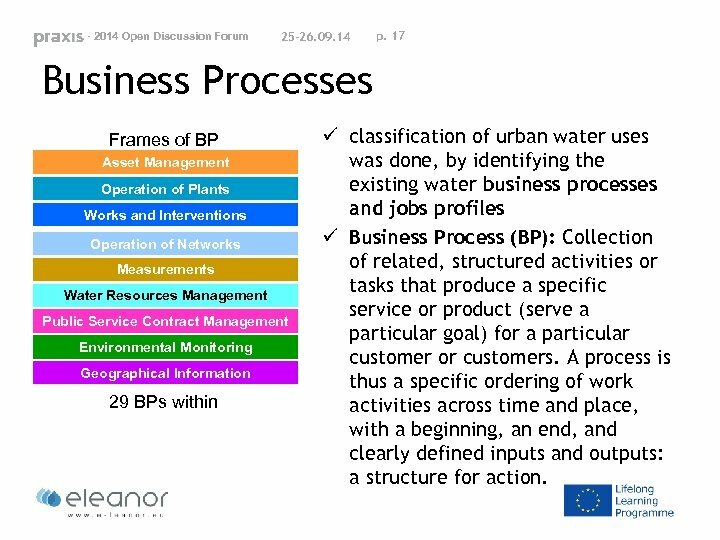 14 p. 17 Business Processes Frames of BP Asset Management Operation of Plants Works and Interventions Operation of Networks Measurements Water Resources Management Public Service Contract Management Environmental Monitoring Geographical Information 29 BPs within ü classification of urban water uses was done, by identifying the existing water business processes and jobs profiles ü Business Process (BP): Collection of related, structured activities or tasks that produce a specific service or product (serve a particular goal) for a particular customer or customers. 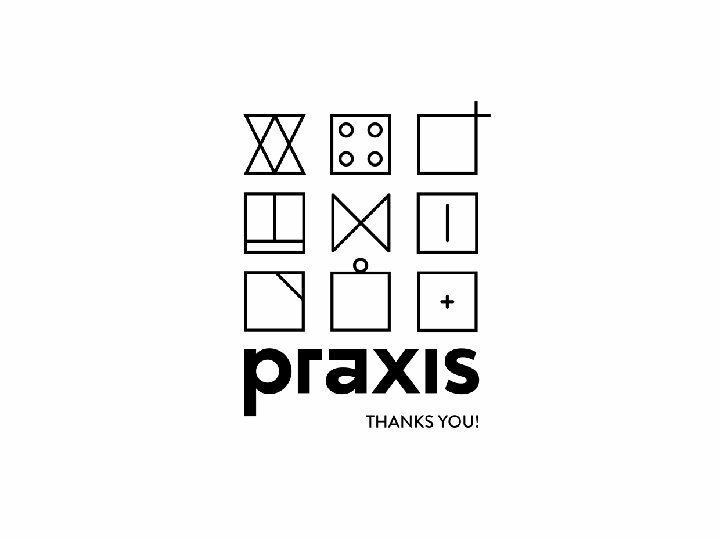 A process is thus a specific ordering of work activities across time and place, with a beginning, an end, and clearly defined inputs and outputs: a structure for action. - 2014 Open Discussion Forum 25 -26. 09. 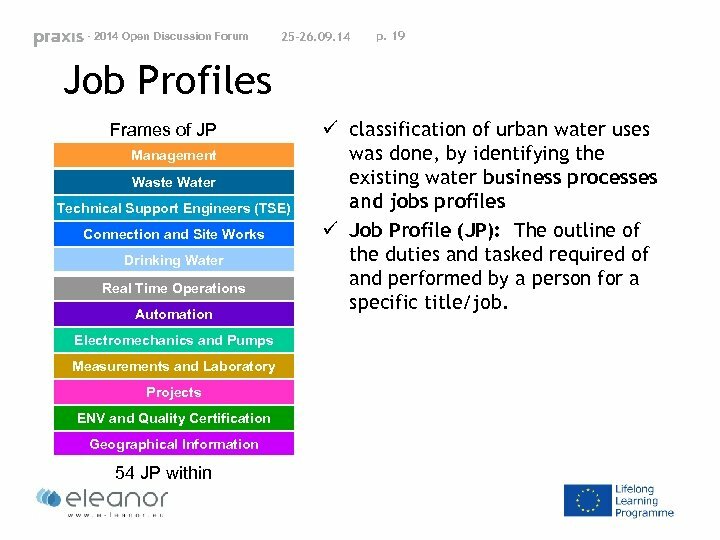 14 p. 19 Job Profiles Frames of JP Management Waste Water Technical Support Engineers (TSE) Connection and Site Works Drinking Water Real Time Operations Automation Electromechanics and Pumps Measurements and Laboratory Projects ENV and Quality Certification Geographical Information 54 JP within ü classification of urban water uses was done, by identifying the existing water business processes and jobs profiles ü Job Profile (JP): The outline of the duties and tasked required of and performed by a person for a specific title/job. - 2014 Open Discussion Forum 25 -26. 09. 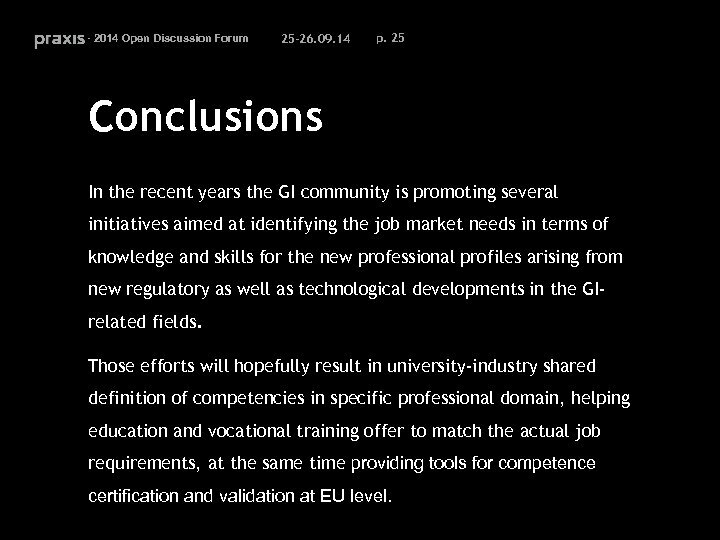 14 p. 25 Conclusions In the recent years the GI community is promoting several initiatives aimed at identifying the job market needs in terms of knowledge and skills for the new professional profiles arising from new regulatory as well as technological developments in the GIrelated fields. 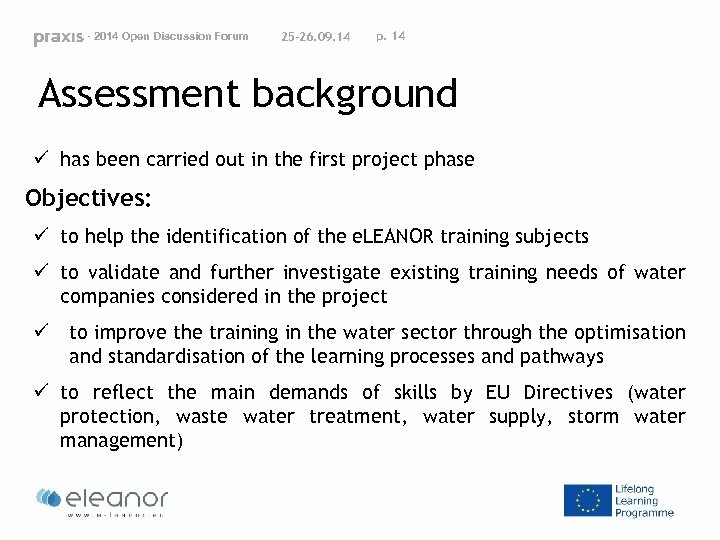 Those efforts will hopefully result in university-industry shared definition of competencies in specific professional domain, helping education and vocational training offer to match the actual job requirements, at the same time providing tools for competence certification and validation at EU level.